Leading the bike of a dead friend on a lonely road of grief. Is there anything more complex and powerful in human existence than grief? If there is, let me know. That horrible waking and dreaming state in which we respond to loss seems beyond all that is - in any way, shape or form - quantifiable. We can feel it, alright. It might be the heaviest emotional and physical weight anyone can possibly bear and yet, it's not often something we can so easily recognize, in others, as well as within ourselves. Grief has properties we all purport to understand, but on the spectrum of human emotion, loss - or rather, our response to loss - is infused with an import that is as rock-solid foundational as it is fleeting. Grief exists somewhere between the tangible and the invisible. Grief is the subject of the extraordinary feature-length debut by Bas Devos, a film that is indelibly infused with the delicate beauty and subtlety of the everything its title, Violet, represents. As both a flower and colour, violet is rife with significance. My own first thoughts, possibly due to my very lapsed (but never-forgotten) religious roots in Christianity, are associated with Holy Mother Mary's deep modesty, her reverential devotion and the world's first blossoming of the unique flower upon Angel Gabriel's deliverance of the message that She would give birth to the Son of God. In more practical terms, violet is the last colour in the visible light spectrum, nestled twixt blue and the invisible ultraviolet. Violet exists in the provocative dichotomous properties of death and rebirth. Beginning with the grain and pixels of CCTV monitors in a Brussels mall bathed in fluorescent light, we witness the violent death of a teenage boy. His body lying in a bloody heap, the picture slam-cuts to a shot of the corpse in the foreground as the tentative figure of teen Jesse (Cesar De Sutter) slowly approaches as he calls out his friend's name. "Jonas?" he asks. He wants his friend to answer, but he knows (as we do) that there will be no response. From here, Devos takes us on the haunting journey of this frail adolescent as he wends his way through a mourning process that is filled with such sadness and confusion that the film is as unbearable as it is compulsively relentless in its exploration of loss. Presented as a series of single shots, gorgeously composed and lit by cinematographer Nicolas Karakatsanis (Bullhead), we are constantly in Jesse's company as he faces confused solace from his parents, spies upon the mother and father of dead Jonas from outside their house, goes BMX riding with his buddies, faces their questioning, their blame and in one extraordinary sequence, drowns himself in a sea of bodies at a concert whilst the music blasts and pulsates hypnotically, charging him with a cacophonous aural barrage that drains him of the heavy weight of grief, if only fleetingly. Devos wisely employs the standard-frame Academy ratio, most recently used to such astonishing effect in Son of Saul by Laszlo Nemes, its intimate qualities that were also the domain of cinema for a half century before the development of widescreen processes, Violet eschews the horizontal expanse that contemporary audiences have become so used to and instead explores the virtues of figures on a vertical landscape (via Karakatsanis's partial use of 8-perf 65mm film). Though some might jump to the knee-jerk response of equating Violet with the work of Gus Van Sant's Elephant and Paranoid Park (perfectly acceptable due to their subject matter of grief, adolescence and formalist qualities), I couldn't help but think of the sheer humanity of William Wyler's pre-widescreen compositions in such emotion-charged works as Dodsworth, The Best Years of Our Lives and most notably, The Heiress. The academy ratio, with its emphasis upon the height of the frame, rather than the width, places us with the characters in such a way that our eyes move up and down rather than right to left. We not only get the force of depth, but the sense of the world's weight from above and the gravity which roots us to the ground. Jesse viewing the parents of Jonas from outside their house is especially evocative of this - it drives home his grief and that of the parents of the dead boy. Violet is cinematic storytelling in its most powerful, evocative form. Devos uses image to express emotion, but to also evoke it within us. 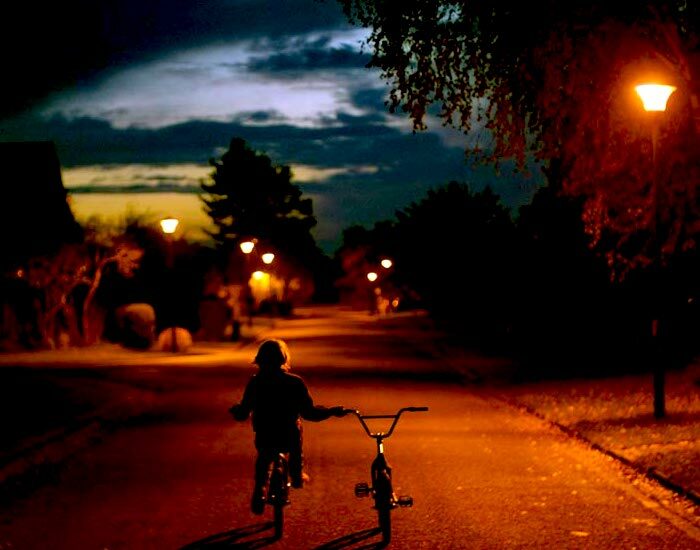 There are indeed images in this film that nobody will ever forget - Jesse riding his bike, grasping the handlebar of his dead pal's bike as he leads it down the dark, tree-lined streets of twilight or even more stunning, a final 10-minute shot as the camera slowly wends its way through the suburbs twixt magic hour and the setting of the sun. It's a film that leaves you in a state of grace. Kind of like Mother Mary and the blossoming of violets upon Gabriel's revelation of the impending birth of God's Son. Life leads to death. Death leads to rebirth. And grief is that delicate spot on the spectrum of human existence - at once vivid and yet, so close to invisibility. Violet opens May 12, 2017 in North America. In Canada, it can be seen at the Carlton and Kingsway Cinemas in Toronto.